This diving is NOT recommended for the pampered diver! The land trip to Jabonga Town may be made from Butuan City or Surigao City. This is half the trip through paved roads. The other half is through dirt road to cross the mountain and reach the village of Magdagooc. The school is just along the road that also along the coast. Opposite this marker is the waiting shed where local fisherfolk await us for boarding. Here's the trip fro this point onward. The banca is small but we can carry about 6 tanks. 4 tanks carefully placed at the bottom of the banca, 2 other tanks are already set-up. 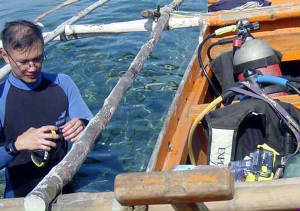 Divers sit close to each other with genuine discomfort and the constant trembling of the engine cannot allow rest or sleep. The banca travels northwward passing 2 of the last villages of Agusan del Norte until the boundary is reached. The boundary is called BITO. The first village of Surigao del Norte is Bgy. Karihatag in Malimono. After an uncomfortable trip, it's time to get into the water. NO back roll nor giant stride!! Don the waist belt, fins and mask. Place inflated gear (BCD, reg & tank) in the water. Get into the water and don the gear. It takes some practice but it'll be easy. But wait, how's the exit? Remove waist belt and place it on the banca. Give the gear to the boatman. With vigorous finning, push up into the banca like a beached whale. Remove fins before moving around the banca or else the knees will surely pop. Bgy. Karihatag is quite a disconnected village. The nearest road ends at Bgy. Pili (Malimono), about an hours banca ride north and at Bgy. 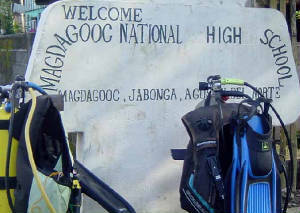 Magdagooc (Jabonga), also an hours banca ride south. The waiting shed faces the shore yet there is electricity. Lunch can be ordered from any house with fish cooked in 3 standard ways- grilled, soup & raw. The cost for the meals can be so cheap, you'd want to leave more money for tips.